Plovers are a group of about three dozen shorebirds with small bills, relatively long legs and large eyes, and have a rather ‘rounded’ appearance. 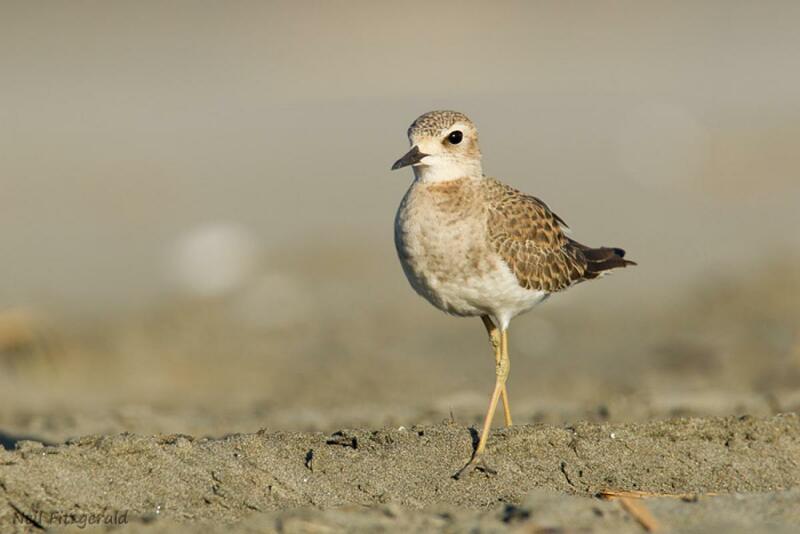 Some plovers are referred to as ‘dotterels’, with the terms used interchangeably for some species, especially in New Zealand. 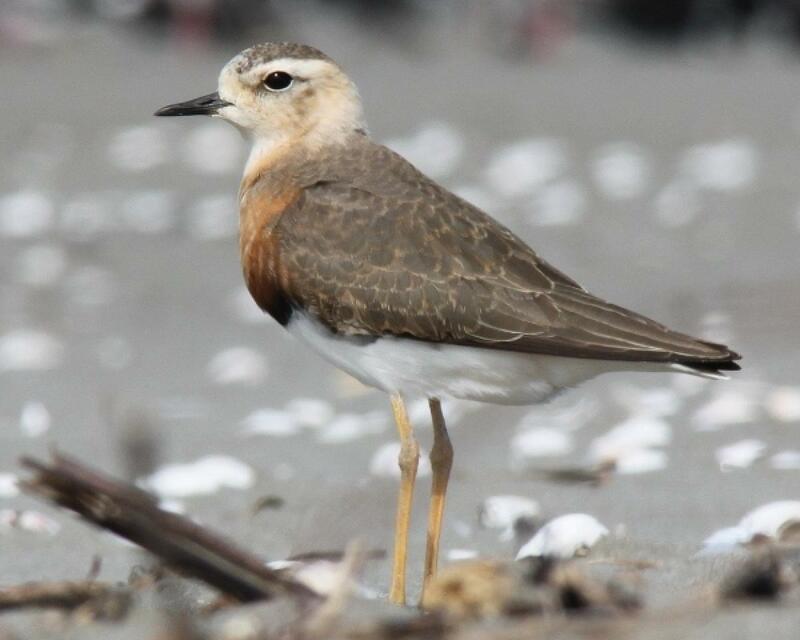 The oriental dotterel (or oriental plover) is one of three migratory plovers that spend the southern summer in large numbers in northern Australia, and for which a few birds occasionally make it across the Tasman Sea to New Zealand. 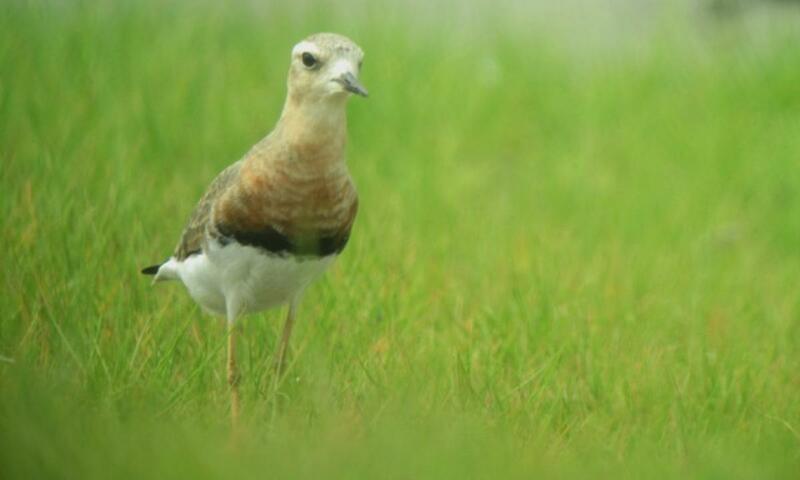 It is a ‘dryland’ wader, more likely to be found on short grass or saltmarsh than on a mudflat. 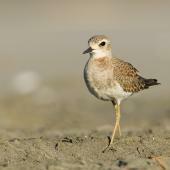 The oriental dotterel is a tall, upright elegant plover with comparatively long pale legs. 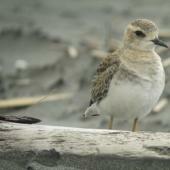 It is usually seen in non-breeding plumage in New Zealand, when it is drab mottled brown above, pale buff-brown on the face and upper breast, and white below. 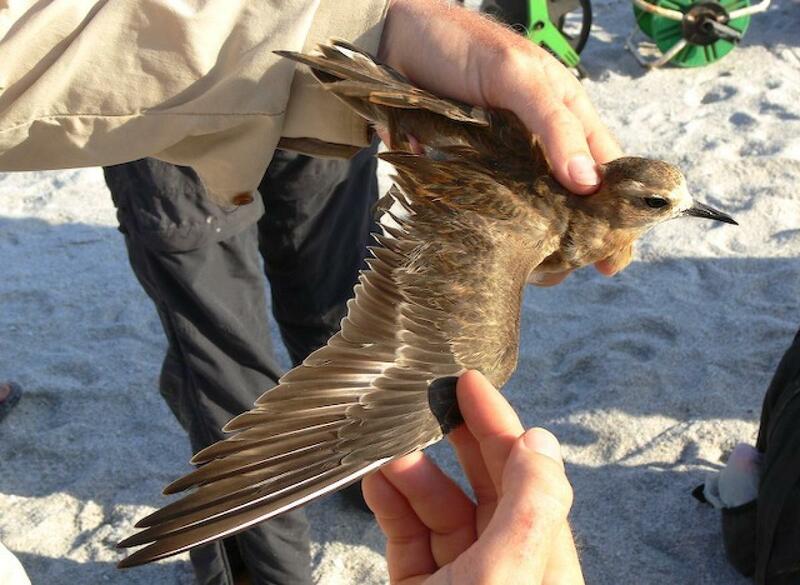 The underwing is dark brown, and there is little or no pale wingbar on the upperwing. 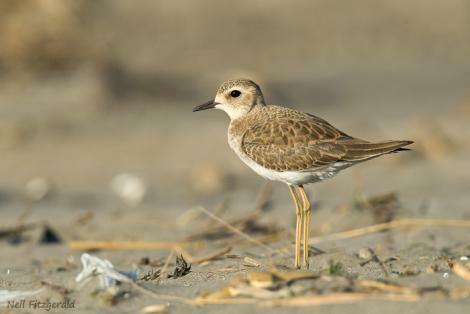 In breeding plumage it has a broad chestnut orange breast band with a black bar below across the breast, and the face white – in some males almost the whole head is white. 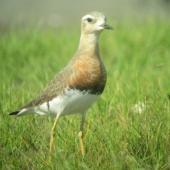 Leg colour varies from pale yellow to pink or brown. 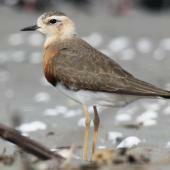 Similar species: in breeding plumage the oriental dotterel is unmistakeable, but in non-breeding plumage it may be confused with New Zealand dotterel and greater and lesser sand plovers. 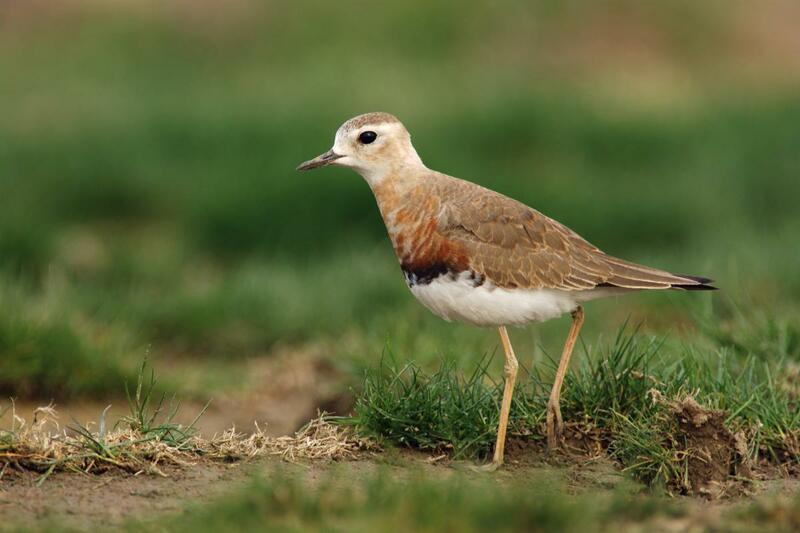 However, the upright stance, long pale legs, dark underwing and lack of a wing bar distinguishes oriental dotterel from all these species. 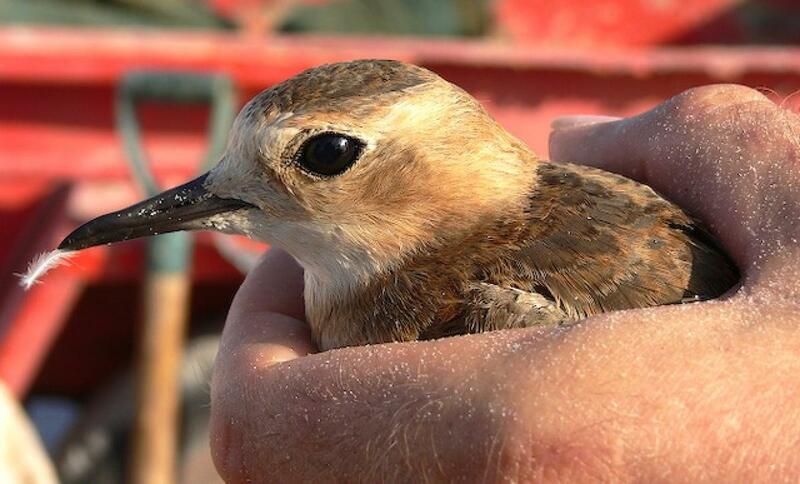 Oriental dotterels breed across southern Siberia, Mongolia and northeast China, spending the non-breeding season in central Australia. 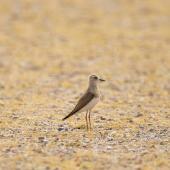 It is a bird of steppe deserts during the breeding season and open grasslands in the non-breeding season. 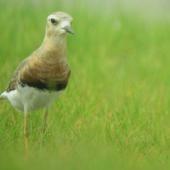 Vagrant birds are likely to be seen on airfield grass or golf courses. 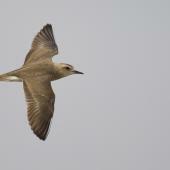 The total population of oriental dotterels is estimated at about 150,000 birds. 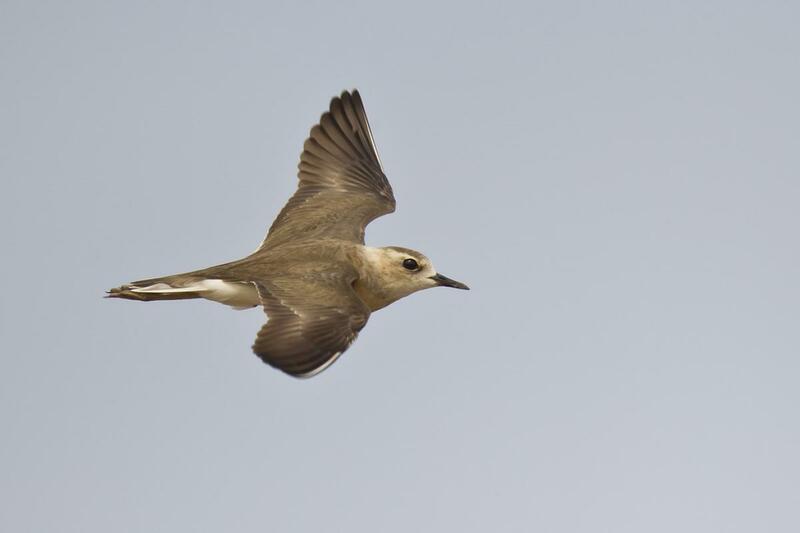 There have been about 19 accepted sightings of oriental dotterels in New Zealand since the first sighting of 3 birds in the Kermadec Islands in April 1908. 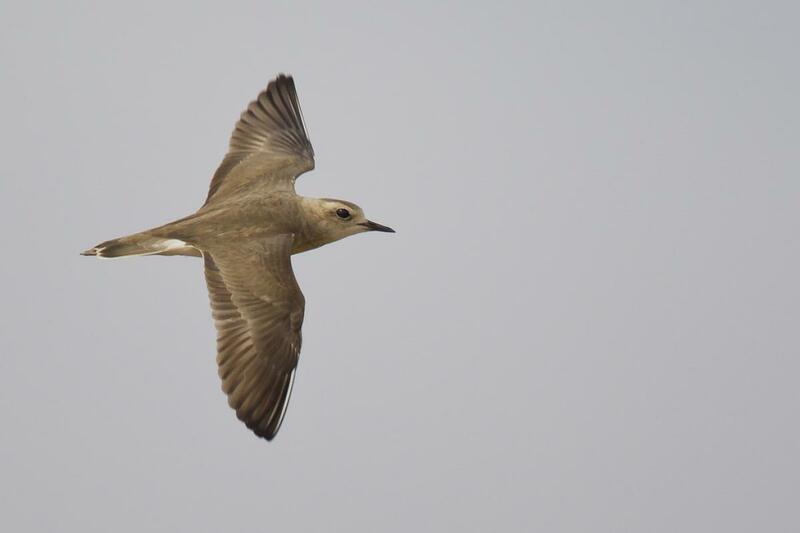 Other than a second record from Raoul Island, Kermadec Island (September 1982), sightings have been spread from Parengarenga Harbour in the north (3 records), south to Invercargill and Waituna Lagoon (February 1988), west to Greymouth (September-October 1982 and October 1987) and east to Chatham Island (November 2000). 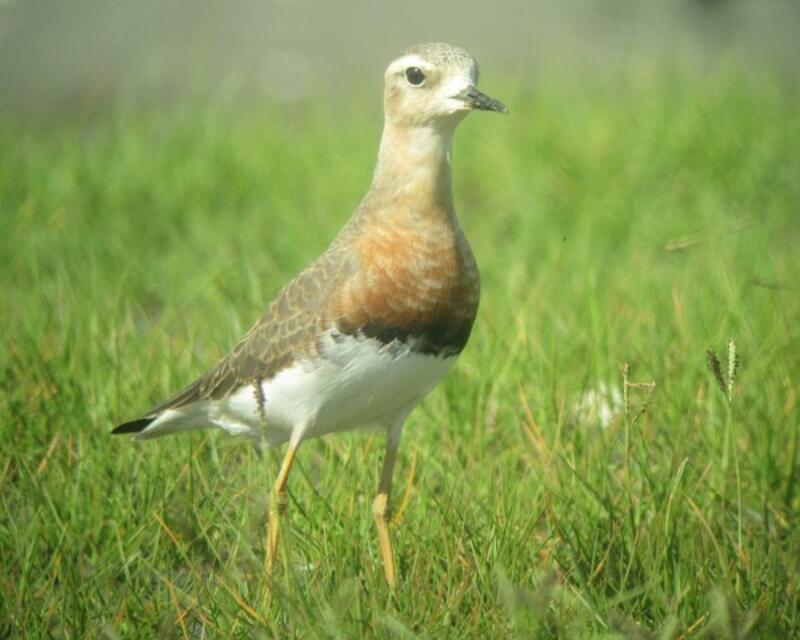 Most sightings have been of single birds, but there were two on the Manukau Harbour in March 1994, and an exceptional 10 in the Firth of Thames in December 1954 - January 1955. 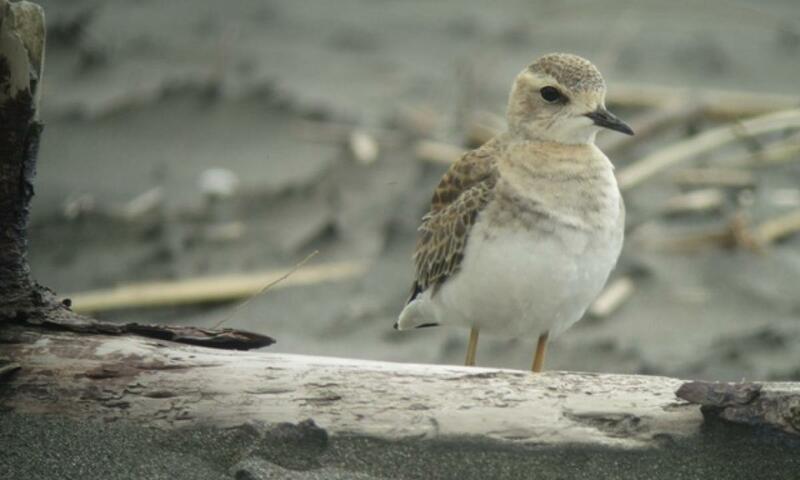 The most recent sightings in New Zealand were one at Port Waikato in September-October 2013, and one at Ohiwa estuary, Bay of Plenty, January-March 2016. 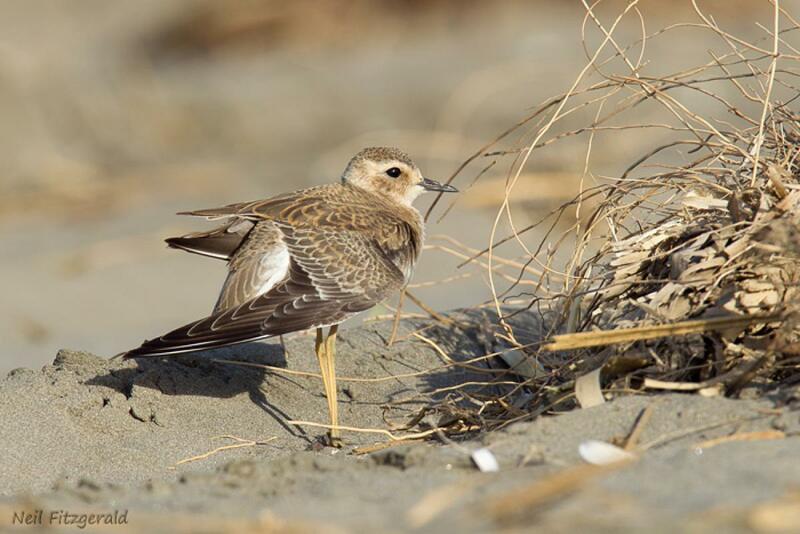 Increasing grazing pressure in breeding areas, together with habitat degradation at stopover sites may be adversely affecting the oriental dotterel population. 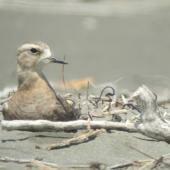 Very little is known about breeding by oriental dotterels. 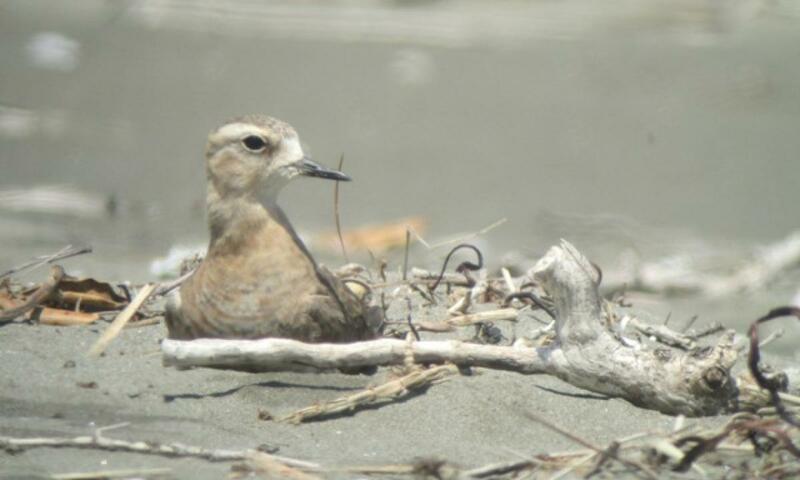 The nest, eggs and chicks were first described as recently as 2006. 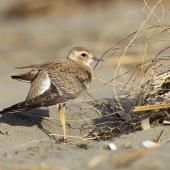 The nest is a scrape lined with vegetation and cow dung; clutch of 3 eggs. 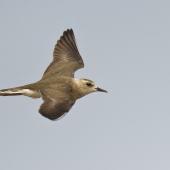 The oriental dotterel is a long distance migrant that probably flies between Australia and China non-stop. 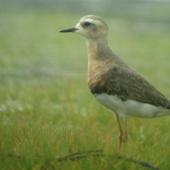 They frequently run, their long legs giving the impression of the bird ‘cycling’. 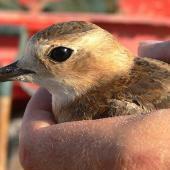 Oriental dotterels are insectivorous. 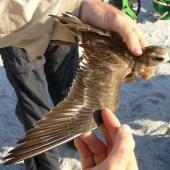 Large numbers were feeding on swarming grasshoppers in Northwest Australia in February 2008. Hassell, C.; Piersma, T. 2010. 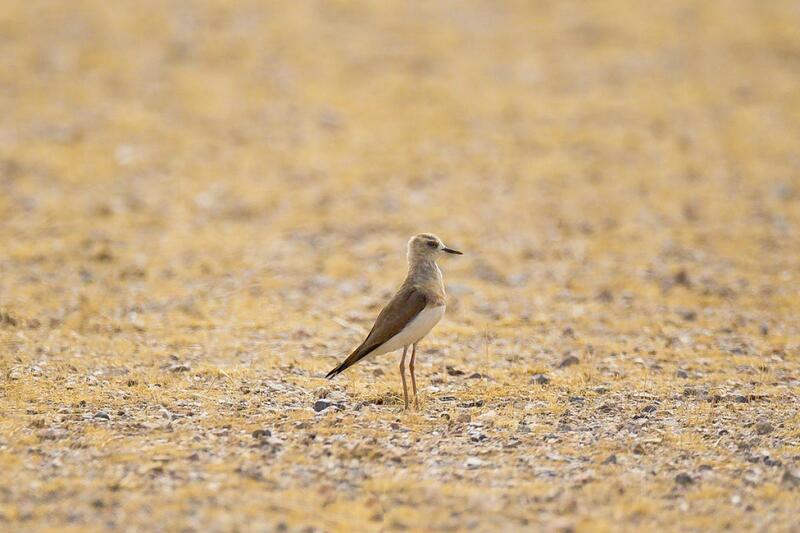 Record numbers of grass-hopper eating shorebirds (oriental pratincole, oriental plover, little curlew) on coastal West-Kimberley grasslands, Western Australia in mid February 2010. 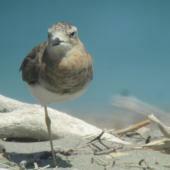 Stilt 57: 36-38. 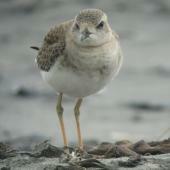 Miskelly, C.M. 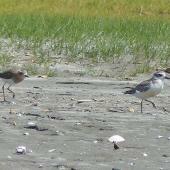 ; Bester; A.J. ; Bell, M. 2006. 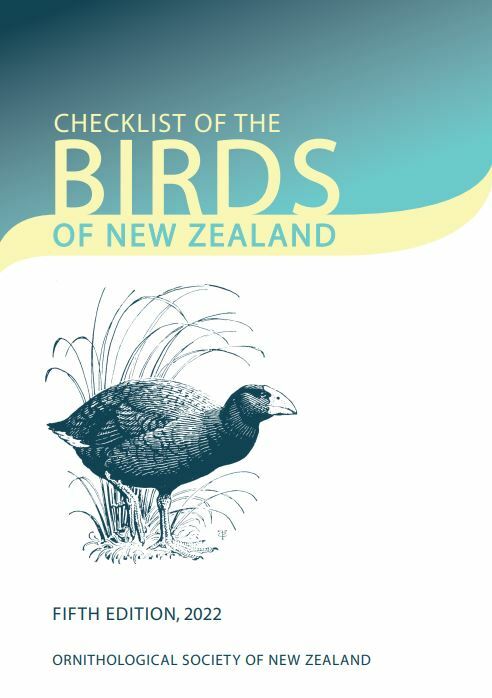 Additions to the Chatham Islands' bird list, with further records of vagrant and colonising bird species. Notornis 53: 215-230. Ozerskaya, T.; Zabelin, V. 2006. 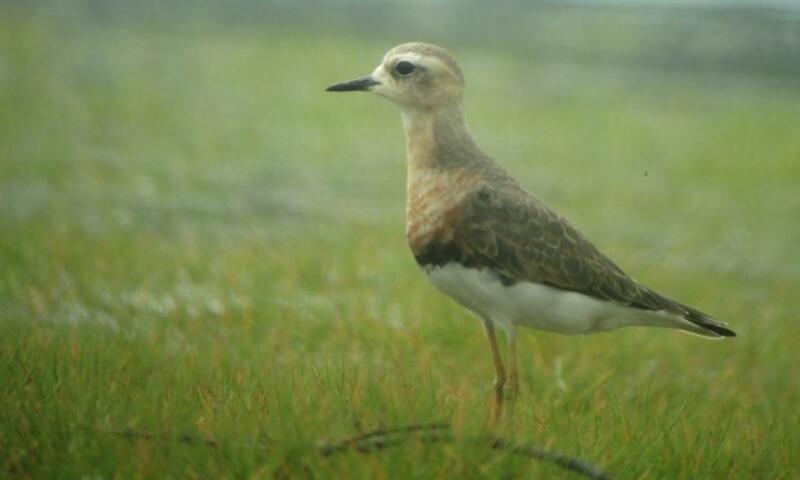 Breeding of the oriental plover Charadrius veredus in southern Tuva, Russia. 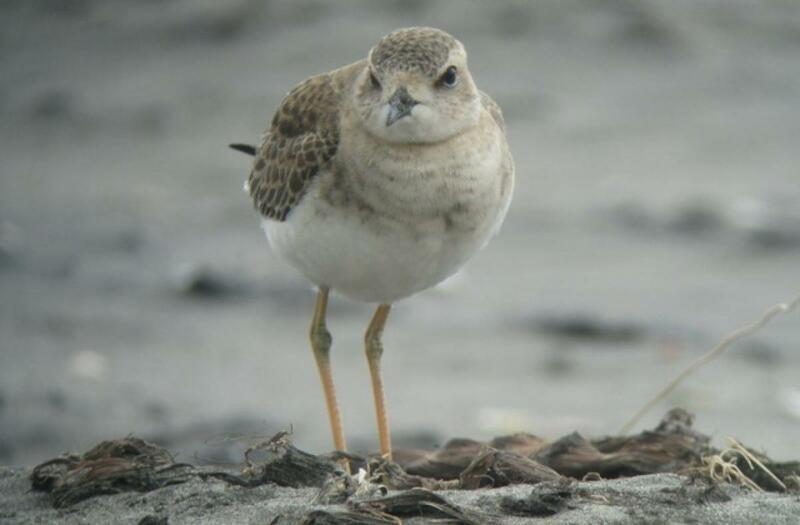 Wader Study Group Bulletin 110: 36-42. 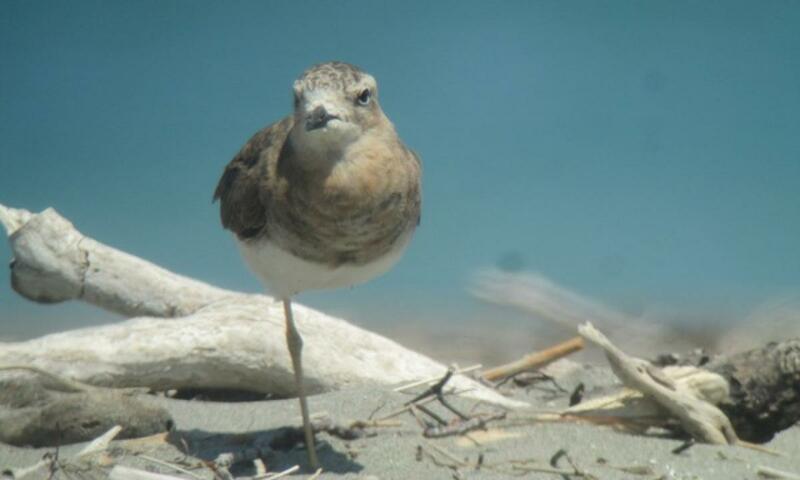 An elegant, long-legged plover that is a rare visitor to New Zealand. 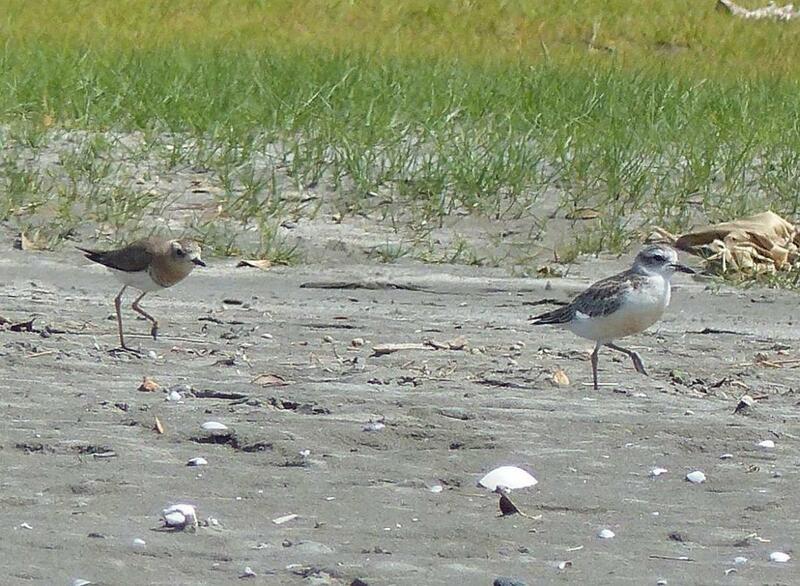 Intermediate in size between banded and New Zealand dotterels, it has long, pale yellow legs. 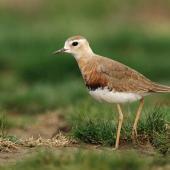 Before breeding it develops chestnut plumage on the upper breast bordered below with black.